Study after study shows that we are in denial about a number of things – our weight and our calorie intake both of which we generally tend to under-estimate. But nothing comes close to the amount by which we over-estimate how active we are. In a 2011 study published in the American Journal of Preventative Medicine, US adults self-reported close to 60 minutes of daily activity everyday (this includes exercise and also other casual activity such as gardening, household chores or walking to the pantry to pick up a chocolate!). However when activity levels were actually measured using an accelerometer turns out we are active for an average of just 9 minutes daily! Guidelines provided by the American Council of Sports Medicine and endorsed by other leading health organizations suggest 150 minutes / week of moderate intensity activity (i.e. brisk walking or jogging) – which only 9% of US adults actually achieved. This level of activity is considered necessary to maintain / improve fitness. So how do we resolve this problem ? A team of exercise physiologists from McMaster University, led by Gillen JB looked to see if we could improve our fitness by exercising for just 10 minutes, 3 times a week (Martin Gibala, a co-author to the study is a pioneer in interval training). After completing a 2-minute warm-up, study participants cycled all out for 20 seconds, followed by 2 minutes of recovery where they cycled at a gentle place. This was repeated 2 more times during that session and then finished off with a 3 minute cool down for a total time commitment of 10 minutes per session. The results were astonishing – within 6 weeks both men & women saw a significant increase in their cardio-respiratory fitness by ~12%. In addition, they also saw important health benefits – mean arterial pressure (which correlates with blood pressure) decreased by 7%. 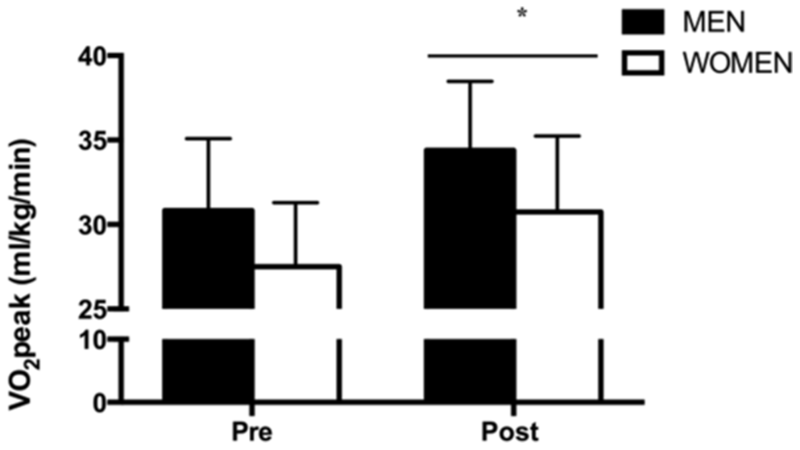 Insulin sensitivity (important for those with pre-diabetes & diabetes) also improved amongst both groups. 24-hour glucose levels however only dropped amongst men (& not amongst women, which warrants further study). This is not the first study to show significant benefits for interval training over continuous exercise – a meta-analysis published in the British Journal of Sports Medicine by Weston et al showed 2x improvement in fitness through interval training compared to moderate intensity continuous exercise. Another review by W Kent in the same publication indicated a 15% increase in fitness within 6 weeks of interval training. What’s unique in this study is the relatively low time commitment required to achieve this remarkable improvement in fitness and health – a level of commitment that almost everyone should be able to make (with of course brief moments of intense effort). In other words there are no more excuses for not getting fit! Previous postHow Fit Should You Be ?